One year ago I went to Tiffany's in search of the perfect engagement ring for my fiancée. The diamonds weren't the only thing that was flawless. To sell diamonds, this sales associate flawlessly uses social influence techniques with precision matching any military psychological operator or corporate communications specialist I've ever worked with. Within minutes she artfully is using 6 separate emotional appeals. At first glance this seems obvious or generic, because all sales associates are friendly. But this social influence-virtuoso in an Armani-suit immediately creates a personal connection by asking my name. She's attractive, which adds a halo effect. Her smiling, friendly demeanor is impossible not to like as she finds a way to compliment me. As the old quote goes, "They may forget what you said -- but they will never forget how you made them feel." She artfully leads me to think of my new decision (to purchase the ring from their store) as an extension of my previous decisions. The sales associate hands me a glass of sparkling water. The crystal glass weighs more than my first car and is strikingly effective at creating a sense of reciprocal obligation. A glass of water is obviously too small a gift to rationally equal the purchase of a diamond from their store. However, reciprocity as a social influence technique doesn't work on a rational level; it works on emotion and social norms. I had already researched carat, cut, colour, and clarity. But her ease in explaining permutations and combinations is authoritative. Within minutes it's clear the sales associate is the expert. As a result, I'm much more likely to trust and defer to her judgment, and ultimately buy a ring from their store. In the context of diamonds, I think you will agree with me this point needs zero elaboration. 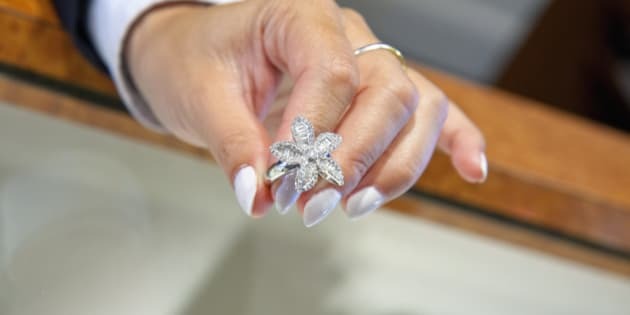 The sales associate points out the "classic" shapes, the "most popular" settings, and the bands that "most people choose". This reinforces the decisions other people like me have made. The more she can bring me to relate to others who've already made the decision, the more likely I am to buy.